Grocery shopping. Some love it, some hate it, but for the majority of us, it is a necessary part of our lives. If you’re a planner, chances are that you’ve already browsed the weekly specials and have a list ready to take with you to the store. 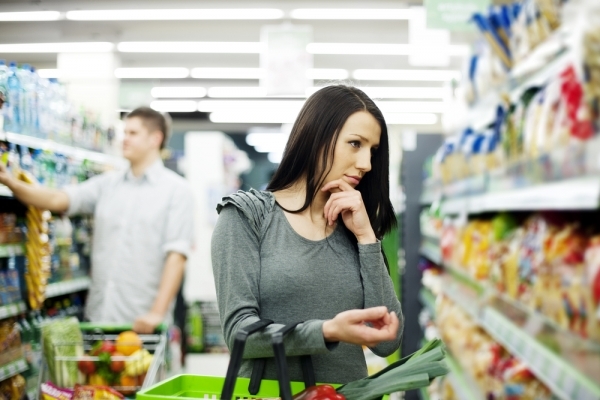 But did you know that 70% of grocery purchasing decisions are made in-store? This means that the way the products are set up and advertised in-store is the main driving factor that influences sales. Let’s take a classic example; potato chips. Research proves that people that buy salty snacks will immediately think of something to wash it down with, and for this reason, stores place the soft drinks right next to them. If your customers are shopping for cheese, a trendy sign that promotes a cracker pairing is a great way for retailers to cross-category merchandise. Have you got a sale on organic oatmeal? Place a sign nearby that advertises local berries – a great topping! If you want to engage your customers and keep up with the latest shopping trends, Dana Industries can help you out. Our pre-printed sign holders are the perfect way to advertise your message. We print on sturdy PVC with our Vulcanized Inks™ which allows colours to pop and ensure that you grab your customer’s attention. Contact Dana today for more information!